What a strange place to find a bullaun; mounted on a concrete pedestal and situated on the corner of a junction. 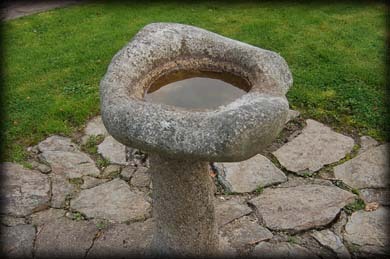 The bullaun is thought to have been moved to here from the ruins of a nearby church. The bullaun itself is huge with a slight lip on one side. It is quite sad to see a wonderful bullaun stone displayed like this. 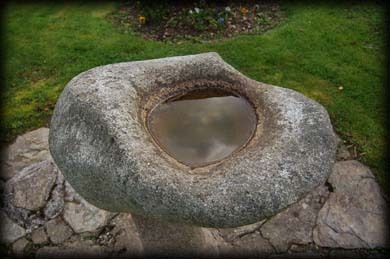 It takes away a feeling of ancientness from the stone. To see bullauns that ooze character and history, visit nearby Glendalough, (click here). Situated: From Kilmacanoge take the R755 west, heading for Glendalough. After approximately 10 kilometres you should reach Ashtown, just before Roundwood there in a left turn for the R765. The bullaun is situated on the corner of this junction. Discovery Map 56:O 1906 0335. Last Visited Apr 2008.